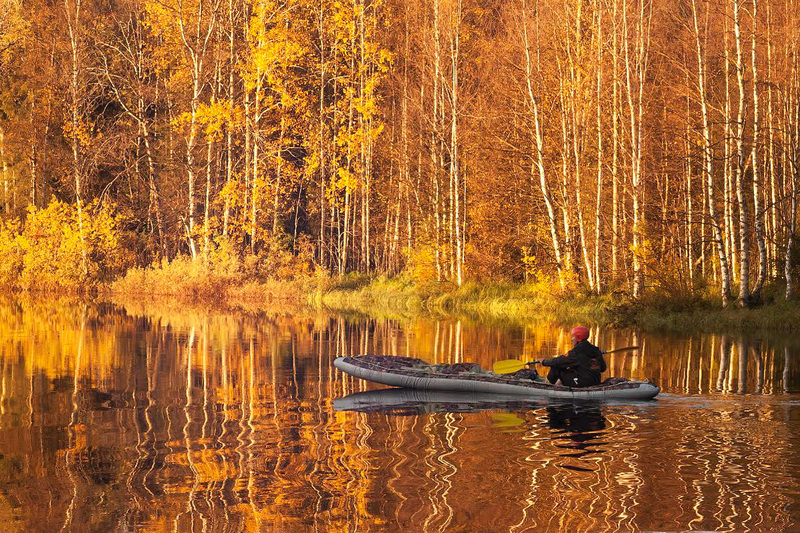 Rafting in Karelian river in fall. A journey across the Republic of Karelia is a special treat for those who love active leisure, changing seasons and northern lights. The Republic of Karelia, located around 1,000 kilometres from Moscow, prides itself on its pristine forests, which make up close to 80 percent of its surface area, and its 60,000 lakes. The republic is a popular destination among Russian and foreign tourists, and features such signature landmarks as Kizhi Pogost, the Valaam Island monastery, Onega and Ladoga lakes and the Ruskeala mountain park. Not just tens of thousands of lakes, Karelia has 73,000 waterfalls, which occupy a total of 36,000 square kilometres, or around the size of two Montenegros and three Luxembourgs. Every summer, these pristine water bodies survive an invasion of roughly 500,000 tourists. The Karelian summer, however, brings joy only to local mosquitoes. Whether you are kayaking down a white-water river or relaxing in a cottage by the lake, you will fall prey to the masses of mosquitoes. Karelia is so crowded in summer that certain stretches of the rapids on some rivers accumulate up to 100 tourists at a time. And that's what they call white water rafting in a “remote and wild area!" However, as early as mid-August, chilly winds from the White and the Barentsev seas blow the remaining warmth away. In September and October, Karelia’s peacefulness is what appeals to travellers: No birds sing by the rivers and lakes, no mosquitoes buzz and no tourists make all kinds of noises. Karelian nature takes a break after the lively summer. The last multicoloured patches fly down from trees and a drizzly fog envelops the land, condensing on tents as if the season were shedding its tears. The strong northern wind that starts to blow on the last day of our journey is the harbinger of the looming winter. At night, the season's first northern lights spread out its multicoloured banners all over the sky. It's time to get ready for winter!